Let's face facts, Pilgrim: if you're saddled with an originally-made-for-television remake of a classic John Wayne western starring the dude from La Bamba and Beverly Hills 90210's Luke Perry, it's best to go in with low expectations. Yet, this becomes a much easier task if you haven't seen the John Wayne film in question since as talented as Lou Diamond Phillips may be, there's only one Duke and he hung up his hat a long time ago. However and much to my surprise, this Canadian filmed take on Duke's 1947 Angel and the Badman centered on the love of a good Quaker woman taming a gun-slinging cowboy is ratcheted up a few gun belt notches by excellent production values and a tender, emotional turn by The Game and 88 Minutes actress Debra Kara Unger. Wounded near the start of this newly released DVD from Lionsgate Entertainment, the tough legend Quirt Evans (Phillips) is given shelter in the Quaker home occupied by the peace-loving and widowed Temperance (Unger), her parents, and her young son. Nursing him back to health during the delirium following rudimentary, Old West bullet removal surgery, Temperance is thunderstruck with Florence Nightingale syndrome falling irrationally in love with the outlaw while he rambles though two days of fever and chills. Once Quirt comes to and begins to regain his strength, his attraction to Temperance grows incredibly fast as well to the near Shakespearean style rapid obsession which prevents him from leaving their home once he can physically do so. Despite a couple of longing looks, mild flirtation, and one scene of stolen kisses early on, the intensity of their attraction doesn't feel entirely genuine. This makes it a little tough to fully buy into as Quirt's decision to stay in town hinges more on Temperance than it does to close his business transaction with Luke Perry's dangerous outlaw, Laredo Stevens. Yet this being stated, it's incredibly refreshing to see that they've cast a truly talented, beautiful and age-appropriate romantic lead to match with our hero even if a forced faux love-scene near the finale of the film feels completely out-of-character, context and time period. Still, all in all, it's a better than average TV time-waster for those not holding it up to Duke's masterpieces, even though it's actually just as watchable as some of his repetitive, lesser fare in his impressive, overflowing filmography. A nice afternoon rental, this Lionsgate release will most likely do even better on cable considering some of its storytelling hurdles like a one-dimensional town marshal whose job essentially consists of entering the scene to deliver a “You don't mess around with Johnny Law or I'll Hang 'em High” like sermon for 95% of the movie. Equally rushed and poorly conceived is a subplot about the Quakers being just as unwelcome in the community as the gunfighters are which is resolved almost as soon as it's introduced and seems to serve merely as an excuse for Phillips to act tough. Likewise, it suffers from the lack of a truly unique villain we'd love to hate since I believe Perry receives less screen time than the cameo of John Wayne's grandson Brendan as one of Quirt's friends. 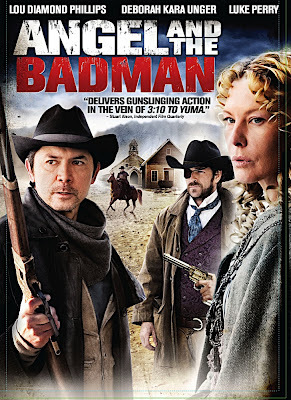 However, while it's relatively short on action for the genre, the movie gets the look and feel right in a polished new adaptation of Angel and the Badman where love can stop a bullet.